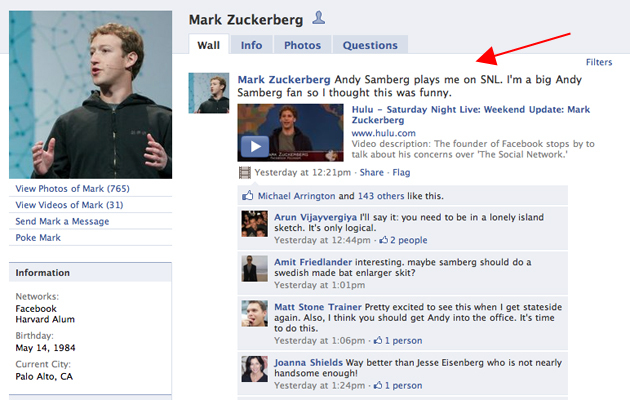 While having a sense of humor is pretty much a necessity if you are at the forefront of pop culture (and yes a top grossing Hollywood movie about you currently in theaters as well as not one but two skits about your company on SNL is pretty much that), I think it’s particularly funny that Zuckerberg found the following lines funny. Well, maybe Zuckerberg didn’t find all of it funny, as he does expresses some confusion about the “hoverboard money” part, which former Facebook Senior Platform Manager and current Path co-founder Dave Morin found “definitely clutch” (Kimberly Parker helpfully explains). But hopefully Zuckerberg’s appreciation of the skit means we will see a less annoying alternative to poking in the near future. Side note: Mad props to Paul Jeffries for his “Ali G Pitches A VC” reference, which is funnier than both the SNL skits combined. And apologies to our foreign readers for the Hulu embeds.